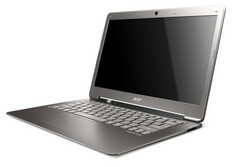 Acer will release Aspire S5 along with the updated Acer Aspire S3. Now the Acer Aspire S3 ultrabook will be introduced in the market but this time it will come up with a 3rd Generation Intel Core i7 processor and a 256GB Solid State drive to boot. The new Acer refresh will cost around $648 USD and is one of the most affordable ultrabooks in the market. It also includes the champagne color. It has been updated for the first time after the original was released and can be found with both Intel Core i3 and Intel Core i7 processors Ivy Bridge. Along with these updates t will include all the features that were available in Aspire S3. It is also believed that along with the new Acer Aspire S3, the Acer Aspire S5 will also be released. Now we have to just wait and watch the features of the latest Acer Aspire S5.